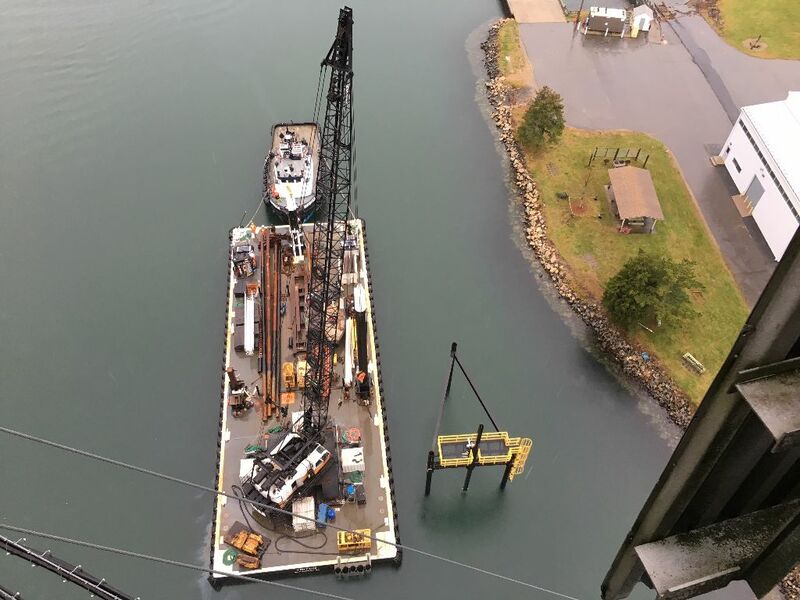 When the funds are approved and released by the Governor’s office, and permits are approved, work will be done to wire the Bourne Tidal Test Site (BTTS) structure to shore to enable turbines and devices to receive shore power and to produce power to the grid. MRECo is in the process of preparing the Draft Pilot License Application required by the Federal Energy Regulatory Commission (FERC) in order to obtain grid interconnection. 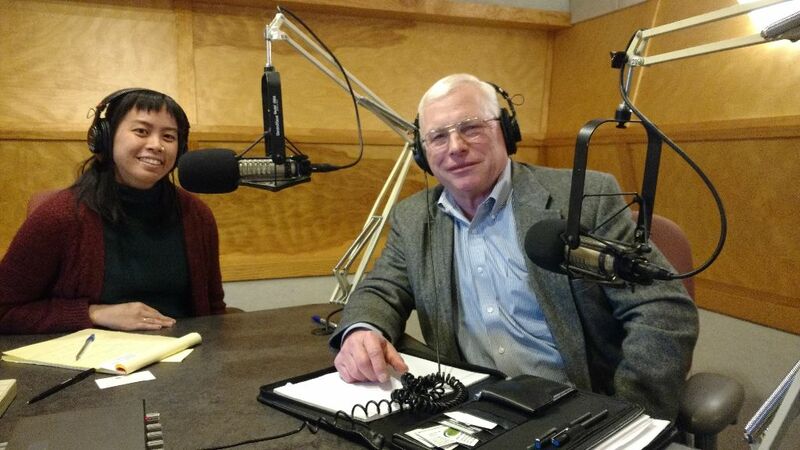 MRECo Executive Director, John Miller was interviewed by Sarah Tan at WCAI-Woods Hole, MA. Tan wanted to know what is happening with tidal energy world wide, in the US and at the Bourne Tidal Test Site located in the Cape Cod Canal. The story will be combined with a field interview Tan will make to the BTTS later next week (weather dependent). Soroush Kouhi listening to the Teledyne ADCP chirping at the boat ramp. 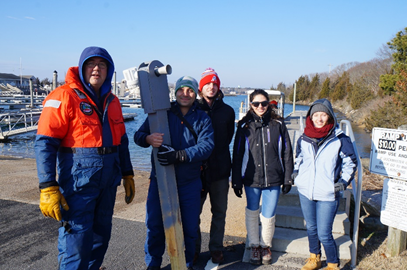 As part of a research project, entitled, “Assessment of the Tidal Energy at a Demonstration Site: Cape Cod Canal, MA, URI doctoral student, Soroush Kouhi and three URI Ocean Engineering students went out to the Bourne Tidal Test Site Friday Jan. 19, 2018 to retrieve the Acoustic Doppler Current Profiler (ADCP) that was deployed one month ago to take water column velocity data. The data will be analyzed to show what the water velocities were for 30 days. The high resolution data will be correlated to result in a projected energy power output. Determining projected power output for a tidal testing area is important because when device developers install their own turbines at the BTTS, they can compare data from their turbine to the actual energy output recorded by the URI team. Of course every turbine is different but all designers hope to top or match their previous power output results. URI and MRECo crew installing water level senor atop the BTTS Platform. 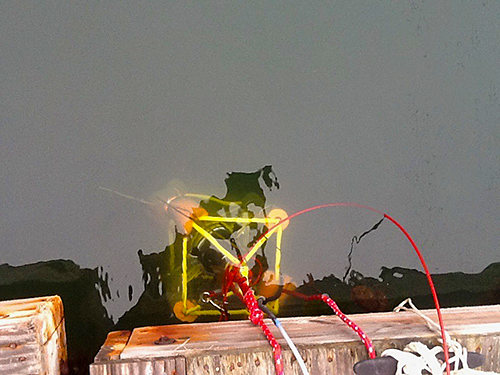 The Teledyne ADCP is enshrouded in a bottom mount frame – called a Trawl Resistant Bottom Mount – that is very rugged and is easy to deploy and recover. It was simply placed overboard, fell to the seafloor, was tethered to the BTTS structure and left to collect data for the past month. As with anything that enters the challenging marine environment, the ADCP was seen being buffeted by the currents and the ice floes that move by with the current. Mercifully its buoyancy bladder deployed on target and it floated to the surface for retrieval. “Now we have the hard work to do. We have to get all the data, analyze and process it and determine next steps. This will take a month or so” said Kouhi. While out there, the team lead by MRECo’s BTTS Site Manager C. Eben Franks installed is a downward looking sea surface level sensor that will correlate tidal heights with the water velocities recorded underwater by the ADCP. All of this data will be combined to further characterize the water flow environment at the BTTS. 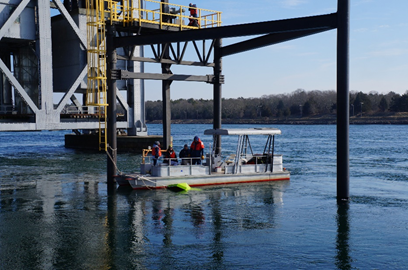 The first of its kind in the US, the Bourne Tidal Test Site (BTTS) was installed in the Cape Cod Canal during the past two weeks. Today, the day before Thanksgiving the barge, owned by AGM Marine, Inc. will pull up its moorings and be towed back to New Bedford, leaving the BTTS to stand ready for business. AGM Marine (Mashpee and New Bedford), drove three piles in the first three days and assembled the structure on top of the piles. 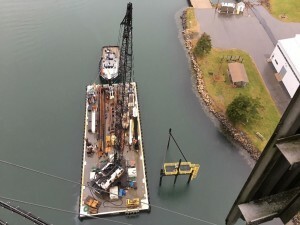 In the past two days, the work platform was secured along with the winch that will power the lifting member that turbines will be attached to. 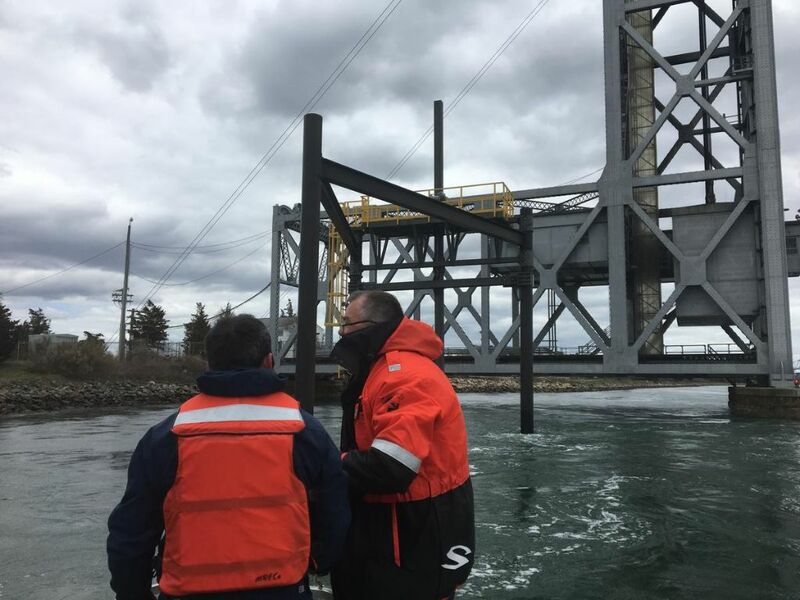 The structure is now secure in the water off the Railroad Bridge and the US Army Corps of Engineers’ Cape Cod Canal Field Office. The structure was built at MassTank (Middleboro, MA,). They are experienced at manufacturing steel tanks and large structures for all sorts of applications including marine and heavy industrial uses. The next step for the test site will be to install the data acquisition, processing and transmission system atop the platform. Engineers from Impact Labs (New Bedford, MA) will be working out there in the weeks to come to analyze and test the systems. 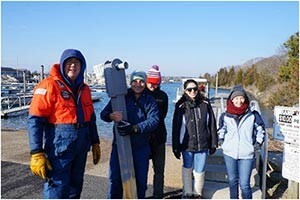 On the heels of that work, University of Rhode Island engineers have expressed interest in deploying one of their Acoustic Doppler Current Profilers to collect data that will enable them to precisely map the water velocity variations during several tidal cycles. This information will be extremely helpful for future operations. MRECo is actively seeking tidal device designers who require a place to get their equipment in the water to test performance and energy output. 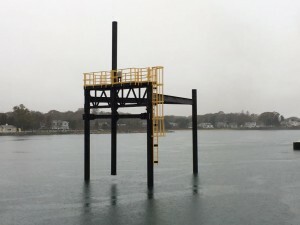 What’s unique about this test stand is that it is pre-permitted, easily accessed by small boat or crane from shore, and can be customized. The water velocity is in the 4 knot range which will enable developers who are aiming toward areas with higher water velocities such as the Bay of Fundy for example, to make invaluable design improvements before scaling up. Several turbine developers have expressed interest in using this site to obtain data on their devices that are being aimed at remote, portable applications such as replacing diesel power generation for islands or for site specific energy generation. We also welcome those who have expressed interest in using the site to evaluate corrosion effects, biofouling in high currents, environmental impacts of turbines and much more. The BTTS is the latest addition to the New England Marine Energy Development System (NEMEDS) which is a network of testing facilities located in a 100 mile radius. These test facilities will help tidal energy device designers obtain valuable information that will enable them to scale up and commercialize more efficiently. 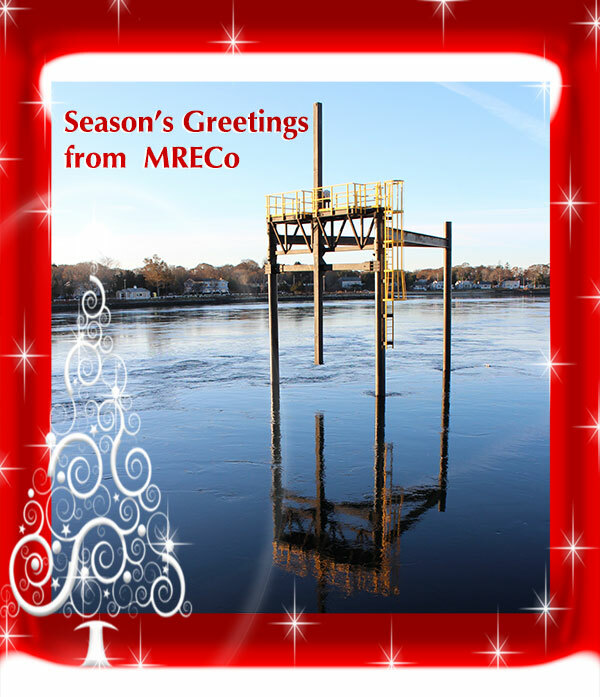 MRECo is a nonprofit organization that educates and involves all stakeholders (academic, industry, governmental/regulatory and public interest groups) to provide the sustainable development of renewable energy in New England waters. 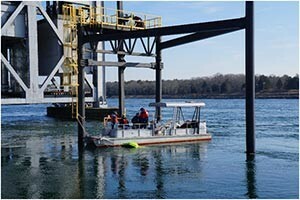 Massachusetts Seaport Economic Council funded the project to support the emergence of tidal energy in New England waters. Local representatives, Third Barnstable District State Representative David T. Vieira (R- East Falmouth) Congressman Keating have been very supportive of the project since its inception. The Army Corps of Engineers have been very helpful in providing secure access to view and access the site as appropriate. 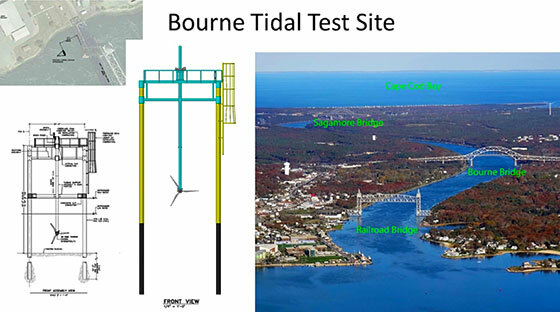 Schematic of Bourne Tidal Test structure. 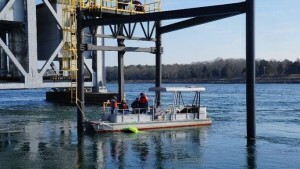 After several environmental studies and careful review by multiple agencies, the Marine Renewable Energy Collaborative (MRECo) has received final approval from the US Army Corps of Engineers to install the Bourne Tidal Test Site within the Cape Cod Canal. “We are very pleased the Corps of Engineers has determined that the Bourne Tidal Test Site will have no impact on the critical mission of the Cape Cod Canal and the local environment”,said John Miller, Executive Director of the MRECo. 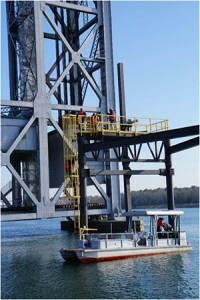 Funding for the test site was provided by the Seaport Economic Council. The site is located well outside the commercial channel and tucked into an accessible spot near the railroad bridge on the mainland side of the canal. Water velocity has been measured at over 2 meters/second (4 knots) on the maximum tidal cycle in both directions, enough to turn different types of tidal turbines to test their efficiency, power output, robustness and more. Turbines of up to 3 meters can be tested with vertical lift provided for easy access. Area within Muskeget Channel that has been tested for tidal and current energy production. (Marion, MA) The good news is that the current does not run as fast in Muskeget Channel as anecdotal accounts would have you believe. The turbulent waters between Martha’s Vineyard and Muskeget Island (a small uninhabited island off Nantucket) have been considered dangerous to pleasure boaters due to torrents of water that flow there. Ten years ago, the town of Edgartown wanted to pursue clean energy solutions for their community and the prospect of capturing just a little bit of that fast current that roils eastward of Chappaquiddick would be something to achieve. 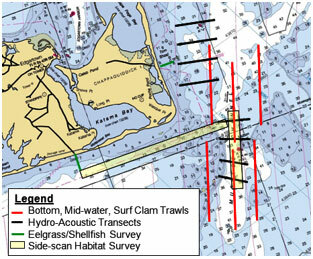 The clean energy committee worked with various parties to conduct resource and environmental studies to characterize the area and to locate a spot where the conditions would favor tidal or current energy production. Since 2013 the Marine Renewable Energy Collaborative of New England, Inc. (MRECo) has led this effort. Earlier this summer, MRECo, worked with partners to conduct additional resource assessments. WaterCube (Daniel Island, SC) conducted water velocity profile surveys of the area and located areas where the current flows up to 2m/second on all tidal cycles. MRECo is now reaching out to tidal developers worldwide to find the best technology for the channel. So far over thirty turbine developers have been contacted and 25% of those have entered discussions with MRECo. For more information, please contact: John Miller, Executive Director, 508-728-5825; director@mreconewengland.org. Session ID: 24443: Ocean Renewable Energy: Resource Characterization, Environmental Impacts, Societal Interactions. The ocean represents a vast and largely untapped renewable energy resource that could be harnessed to support sustainable development while reducing carbon emissions. However, much research is required within the oceanographic community, in collaboration with other disciplines, to characterize ocean resources, and to assess the environmental impacts of ocean renewable energy systems. This session seeks contributions spanning a broad range of topics related to ocean renewable energy (offshore wind, wave, ocean current, tidal) research such as resource assessment, instrumentation, feedbacks between power extraction and the resource, and optimization at array or regional scales. Contributions regarding potential environmental impacts (physical/biological), and societal interactions (e.g., social acceptance) are also invited. For instance, research methods, plans, and results from global investigations into field techniques, statistical modeling, and integrative mapping used to assess the impacts of offshore renewable energy system on presence, distribution, migration, dispersal, and/or abundance of marine species at local and regional scales. We also invite reports of research into the potential or existing effects such as the presence of artificial habitat, noise, electromagnetic field emission, and species barrier or displacement, at specific sites in the marine environment. Follow this link for a printable version of this news release. MRECo invites you to stay informed! September 13, 2018 – End of Summer News! alternative source of clean, renewable power. MRECo, partner, Bradshaw Lupton of piRshared designing iOT, internet of things connectivity for the FSI Acoustic Current Meter (ACM) at the recent remotely operated underwater vehicle design competition at the Sandwich Stem Academy. 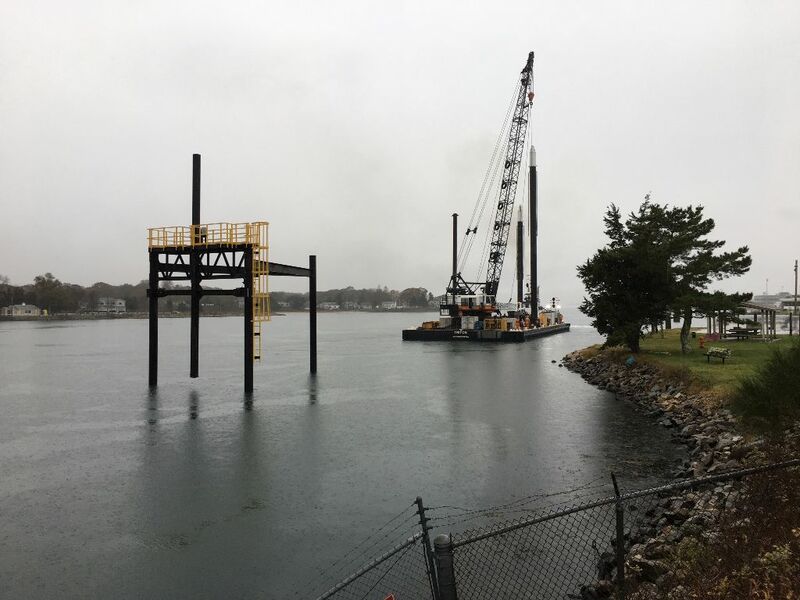 (Bourne, MA) Engineers associated with the Bourne Tidal Test Site (BTTS) have been field testing a simulation of the data acquisition system that will be installed on the actual tidal turbine test structure. BTTS is going through its last paces for permitting and once the US Army Corps of Engineers, USACE, signs off, the actual test structure will be installed. 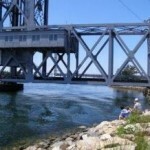 To enable tidal device designers and developers to understand how their turbine is performing in the Cape Cod Canal, they will need to know what the current velocity is during all tide cycles. In order to do that, a team of talented engineers, inventors and scientists are collaborating to see firsthand how fast the water is moving in the Cape Cod Canal and how much power one might be able to harness once a turbine is installed. There have been several small scale demonstrations done in waters near Buzzards Bay, using a series of small parts and home spun resources to show how data from the FSI ACM Current Meter can be collected , processed and transmitted via sophisticated telemetry to computers anywhere in the world. FSI has provided use of one of their ACM Current meters to measure current direction and velocity at the demonstration site located at Eastwinds Lobster and Grill in Buzzards Bay to simulate data transmission and display. The real time current data was captured by an ACM-PLUS-200 acoustic current meter from Falmouth Scientific Inc.(Cataumet, MA) FSI VP of Sales & Marketing, Carl Mancuso stated, “we are happy to work on this important application for our technology. Ocean energy operations worldwide require precise and reliable current speed and direction readings. We welcome the opportunity to contribute to the establishment of the BTTS”. FSI’s ACM-Plus-200 is measuring current in meters per second. That data is then being processed using software provided by piRshared (Wareham, MA). That “scrubbed” data will eventually be transmitted through a powerful computer that will be installed on top of the tidal test structure. 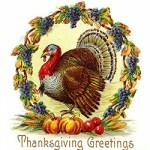 The data will then be transmitted via Wifi and/or cellular service to the website for display (www.mreconewengland.org). The data output is being hosted at a web site which was created by Bradshaw Lupton of piRshared, a Wareham system integrator and engineering genius. piRshared is supplying system design, integration, many small and big parts and a demonstration site located close to the canal. FSI’s ACM being deployed from Eastwinds Lobster and Grill dock in Buzzards Bay, MA. Buckets contain computers and wifi devices for data transmission. A key element of the BTTS project is to inspire students of all stripes to get involved. To that end we have been reaching out to STEM organizations throughout the US and within MA and the region. 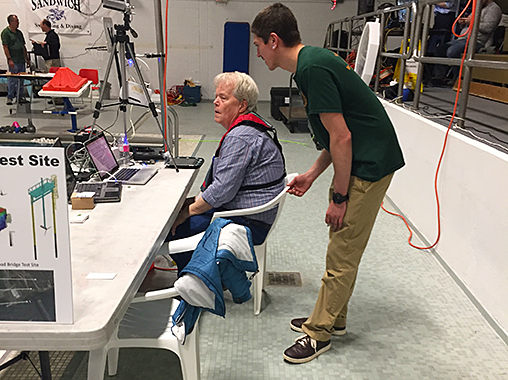 “Thanks a key volunteer, Bradshaw Lupton of piRshared we were able to put the FSI ACM in the pool during the recent MATE ROV Competition at the Sandwich STEM Academy pool to show the students, teachers and parents how to capture, transmit and display real time water velocity data using off the shelf equipment and ingenuity. We continue to demonstrate the ins and outs of the data transmission system that when fully operational aboard the BTTS structure will enable students from around the world to access the data and make predictions of power output for their various engineering projects, said John Miller, Executive Director, MRECo. Seaport Economic Council is funding the development of the Bourne Tidal Test Site (BTTS) as part of Baker-Polito administration’s commitment to promote prosperity in seaport communities of all sizes as well as to cultivate job and economic growth in the maritime economic sector. The Seaport Economic Council, chaired by the Lieutenant Governor of the Commonwealth and administered by the Executive Office of Housing and Economic Development with support from the Office of Energy and Environmental Affairs, challenges the 78 coastal communities of Massachusetts to leverage their unique geographic advantages in order to grow jobs and the economy as well as prepare for the future as we confront the challenges posed by sea level rise and increasingly powerful coastal storms. piRshared Labs (Buzzards Bay, MA) is an integration, communications, software, hardware, mechanical engineering firm founded by three former roommates at Worcester Polytechnic Institute in 1968. Their work spans and connects all current platforms from the Internet of Things on esp8266, arduing, raspberry pi, android, IOS, through to IBM BlueMIX and Watson products. 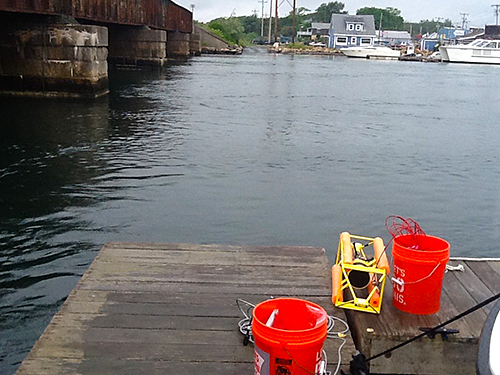 The Bourne Tidal Test Site demonstration project involves the firm’s marine sensor, mechanical engineering and communications experts in placing instrumentation in inland waterways and transmitting the data through the cloud via MQTT for STEM students and others to view. piRshared will offer iOT classes at Sandwich High School in September. Many thanks to contributors: Jeff Coleman, Scott Haigh, Raymond Coleman and Bradshaw Lupton.